If you own a tankless water heater, whether it’s electric or gas, you know how great they are. The endless stream of hot water, unparalleled energy efficiency, and long operational lifespan make going tankless an easy decision. But to ensure that you reap the rewards of going tankless, you still have to make sure you get it installed right and take care of it. Fortunately, unlike a traditional tank water heater, keeping a tankless heater running smoothly won’t be too costly or inconvenient. To help you get the most out of your water heater and better understand tankless water heater maintenance, we’ve compiled 5 “Must Do’s” for tankless owners. Angie’s List recommends having a professional plumber install your tankless water heater, and we agree. When you’re looking for a plumber, make sure that h/she is licensed (required in the state of Texas) and insured. For added reassurance, do your research ahead of time by reading some online reviews and get an idea of how long they’ve been in business. While it’s technically possible for you to install the unit yourself, we strongly discourage it as you’re dealing with electric requirements, proper venting, and accurate gas line sizing. Plus, the last thing you want is to end up with a poorly installed water heater. A poor installation will cause poor performance and it may end up significantly shortening the life of your unit. Moreover, if the person who installs it doesn’t consider how much hot water you’ll need, they may install the wrong unit which could lead to a compromising and unsafe outcome. Put simply, it’s really not worth hiring an unlicensed handyman (or attempt as a DIY project) when it comes to properly installing your tankless unit. If you’re switching from gas to non-gas, you should ensure that your home is wired so that your unit will have enough power. Gas tankless water heater owners don’t have to worry about this, but many older homes will not have enough power to operate an electric tankless water heater. You can find the information about your electric service on your main breaker. Check your service level against the requirements of the tankless water heater you’re considering. If you don’t have enough power, you’re going to need to hire an electrician to add wiring. While some electric tankless water heaters say they’re designed to be maintenance free, we still encourage annual checkups. For example, if you live in an area with high levels of hard water, we recommend a licensed plumber inspect it annually. Beyond checking out the unit, the plumber should flush the system and clean the inlet screen filter to keep the unit in tip top shape. Gas tankless water heaters also require annual maintenance. Because of the complexity of gas water heaters, when things go wrong, it can be difficult to figure out the problem. With this type of water heater, you should have an experienced, licensed technician out to your home at least once a year. They will check to make sure the heater is performing properly and safely. A solid tankless water heater is designed to hold up, even in especially cold weather. So as long as you had a water heater installed that’s capable of providing hot water in the winter, you shouldn’t have too much work to do. But that doesn’t mean you can totally neglect your water heater when temperatures drop. You should try to minimize the effects of the cold on your water heater. For example, be sure to insulate any external pipes. The hot and cold-water lines running to your unit will be the most susceptible to freezing. As you may know, tankless water heaters have freeze prevention heaters, but those only work when the power is on. So make sure your unit will have enough power for the winter months. If you live outside of Texas in a particularly cold climate, it may be worth considering purchasing a backup generator to provide power in the event of a blackout. It’s worth keeping in mind that your tankless water heater has a minimum flow rate. That means it needs to detect a certain amount of water demand before it activates. In most cases, the minimum flow rate is around 0.5 gallons per minute. However, you should check the specifications on your unit to be sure. While minimum water flow shouldn’t be a big issue for most, it’s something to check if you’re not getting the hot water you need. If you’ve never owned a home before (or a tankless water heater), knowing what to do to keep your tankless water heater running well may seem intimidating. 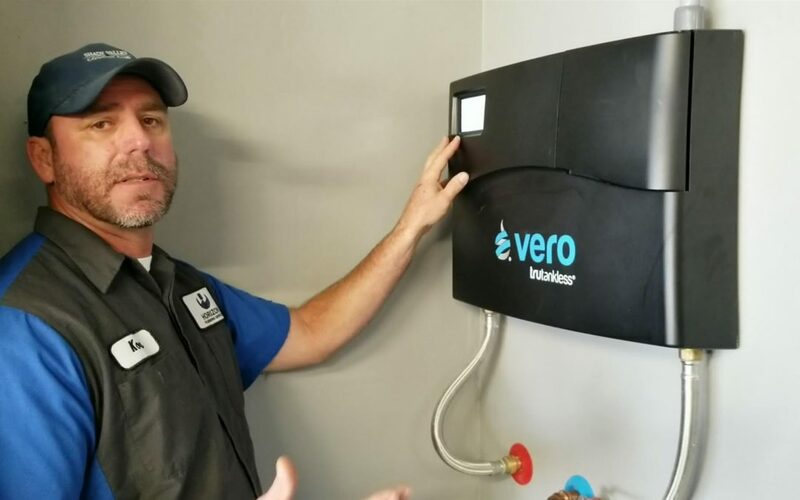 As long as you properly vet any plumber before you hire, ask plenty of questions, read the owner’s manual, and listen to their advice, you drastically minimize the risk of things going awry with your tankless. Have questions about installing or maintaining your water heater (tanked or tankless)? Give Horizon Plumbing of Dallas / Fort Worth a call at (817) 477-6891 (Monday – Friday), or visit www.horizonservice.net.